Doctor-friendly HP tablet 'leaked' by HP? HP has "leaked" its own tablet in a promotion on its website, hinting that the Windows 8 slate's release date is not too far in the distant future. After popping up in an advert last week, the back of the tablet has now been shown off in another promotional photo. If this is a real tablet and not just a dummy (or a bespoke computer created specifically for Lucile Packard Children's Hospital) then it's likely to be the HP Slate 8 (channelling your inner Dr Seuss there, HP?) which is set to be an x86-tablet with a 10.1-inch display according to earlier leaks. It looks like a slim silvery-grey affair with a headphone jack (we think) along the top edge and an HP logo on the back. This is the kind of in-depth analysis you come to TechRadar for, right? 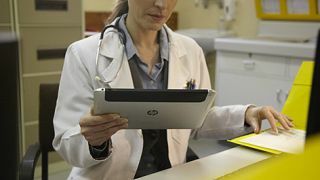 Anyway, the HP tablet is shown in the hands of a doctor (or, at least, an actress wearing a white lab coat with a stethoscope around her neck) so it seems likely that the slate will be aimed at business users rather than Joe Public. That's a theory backed-up by the fact that another leak suggested it will run Windows 8 Professional rather than the tablet-friendly Windows RT. When the HP Slate 8 will hit the market remains to be seen, although CEO Meg Whitman promised they'd launch "next year" back in 2011, so we're expecting them to launch at some point shortly after Windows 8 in October.